You have probably made jokes about a certain Swedish retailer and how hard it is to decipher their furniture instructions. Their products take blood, sweat, and tears...and maybe a few bottles of wine to assemble. Fortunately, the opposite is true when unboxing and mounting your SANUS TV mount. We make the process as quick, simple and worry-free as it looks in this video. The ease of installation starts when you open the box. Every component of the mount is layered in just the way you will use it. This means that you won’t have to waste time digging around to find the right piece, just grab the next one in the box. Our hardware is also labeled and packaged individually so you don’t have to dig through a big bag of screws at each step of the process. While the different types of mounts will vary slightly, here is a step-by-step overview of mounting a SANUS TV mount on your wall. If you are confused at any point in the process, we have a US-based customer care team standing by that can be reached 7 days a week by dialing 1-800-359-5520. Line the bracket up with the holes in the bracket extender. You will know you have it right because everything will line up perfectly. The bracket doesn’t block anything it shouldn’t – you still have easy access to your power and cable inputs. Pro Tip: When attaching these components to the back of your TV, we recommend carefully laying the TV face down on a protected surface like a blanket or rug to avoid scratching or damaging the screen. Find the center of your wall studs with a stud finder. You will want to verify that the studs are 16” apart. If your home doesn’t have standard stud spacing or if you want to mount your TV in the corner, you can still get your TV up on the wall with a single-stud TV mount. 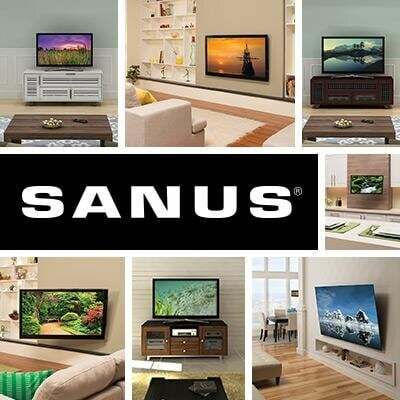 Included in every TV wall mount box is a SANUS wall plate template. This really takes the guesswork out of drilling holes in the wall. After you have found your studs, simply lay the template on the wall, make sure it is level, and drill your pilot holes. Pro Tip: If you are mounting into steel studs or concrete, you’ll need to use specific hardware to make the pilot holes. The wall plate will line up perfectly with the pilot holes you have drilled with the wall plate template. Drill in the provided super hefty lag bolts to secure your wall plate. If you are using a full-motion mount, you will need to attach the articulating arm to the wall bracket to allow for the swivel and tilting motion. It’s secure when you hear the signature SANUS “click” into place. Mounting your TV is an easy way to ensure that everyone watching will have the best seat in the house. It is such an easy task, you will wish you had done it months ago. Forget the stand, hang it up!